The sun shone on us again for California Coastal Cleanup Day. 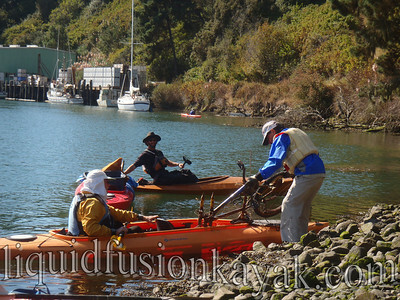 This was our 3rd year organizing an on-water cleanup of the Noyo River Estuary and Harbor. 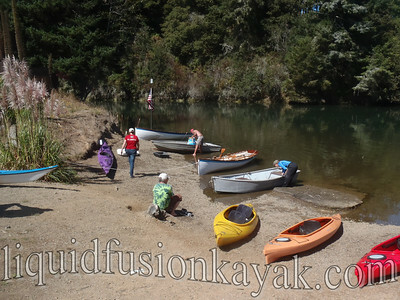 We had a great turn-out with 11 paddlers on the water and 5 rowers. 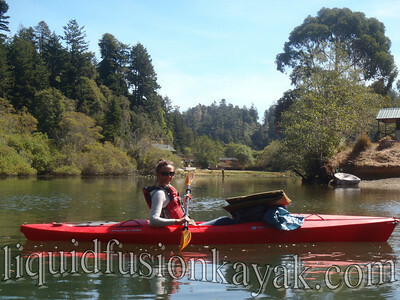 As usual, Jeff paddled the wood duck and towed a kayak garbage barge for us to empty into when our bags an boats got too heavy. It was also great to have members of the Lost Coast Chapter of the Traditional Small Craft Association helping with the pick up too. Jim and Stan both rowed and towed garbage barges behind their craft and hauled a lot of the big stuff that didn't fit into our kayaks. 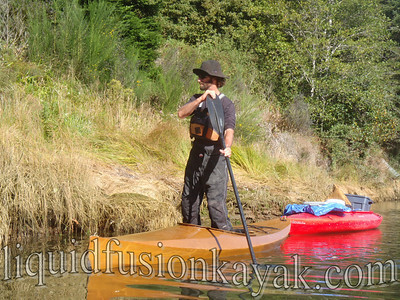 Jerry paddled a double kayak so that he could get some of the bigger items - a chimney pipe and a rusty old bicycle made it into his boat. 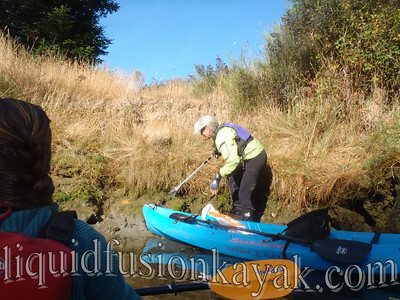 I don't have any photos but June hauled a microwave out of the muck which sat between my legs in the double that I was paddling. It was a great day all around. The weather was perfect and we enjoyed company as we picked up trash. The good news is that there was less trash on the river than in the previous 2 years. We filled our dumpster but did not overflow it like last year. Less trash meant for a speedy pick up and more time to enjoy a potluck BBQ at LFK Headquarters on the Noyo afterward. 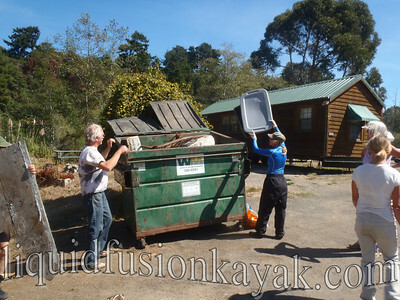 We will be adding this to our regular CA Coastal Cleanup Day routine. Mark you calendars for September 15, 2012.